First, before getting to the regularly scheduled Blog of the Week post, can someone please tell me that this is indeed an early April Fool’s prank!??? This cannot be serious, can it? Who the hell could conceive of spending $100 million to commemorate a 200 year old war??? You might have noticed by now that these BotW posts focus on blogs that are more or less aligned along a “theme”. Food and wine are two of my fave things, but both pale in comparison to my obsession (yup, if its not one, it’s close) with politics and more specifically with political data. So it stands to reason that one of these BotW scribbles would sooner or later look at a political blog. And one that is not simply a series of partisan rants. ThreeHundredEight is such a beast. 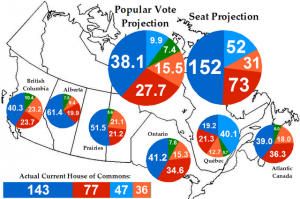 The authors do a bang-up job in providing the reader with a balanced analysis of the latest polling numbers – not by focusing on one poll alone, but my looking at trends in the data over time and using a weighted average of all of the major polls. As a data geek, I can, from a professional perspective, appreciate the focus on trends and on the need to examine a weighted aggregate of the polling results. Interpreting poll results is nasty business most of the time, but ThreeHundredEight ably navigates the briny waters admirably and uses methodologically robust tools. Check out this text from the site’s Friday posts which talks about two polls that were released the day prior. I’m not going to compare the two polls as they aren’t comparable. Angus-Reid uses an online panel, while EKOS uses a telephone system. 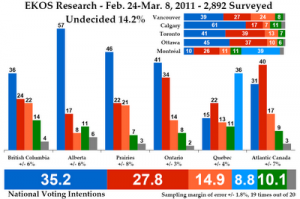 Angus-Reid polled on two days (March 8 and 9), while EKOS polled on nine days (February 24 to March 8, excluding weekends). Finally, Angus-Reid polled 1,021 people, while EKOS polled 2,892 people. The two polls aren’t at all the same. Don’t compare the two! Not. Ever. THIS is why I like this site – no dancing around similarities in modes, MoEs or sample sizes. Just cut to the quick and say that only an utter fool would look at these two polls side by side! YES! A victory for robust statistics! Woo-hoo! Then they go one step further and extrapolates these results to come up with estimates of how these polling numbers translate into seats on a regional basis. Anyhow, be you a data geek, a political geek or just like pretty charts with lots of colours, ThreeHundredEight should be a site that you plug into your RSS feed!